The Multicultural character of the Russian Federation is not reflected in the history education which has a strong Russocentric approach. History education provides no answers or understanding for the multicultural society in Russia, neither for the ethnic conflicts and tensions at hand. In this context, the EUROCLIO-MATRA project “Mosaic of Cultures” led to the publication of both a student book and a teacher book. 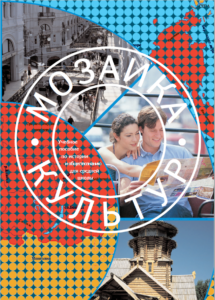 It contains innovative and multicultural material with pedagogical and didactical recommendations and is ready to use for Russian classroom practice. Coordinators: Alexander Shevyrev (Moscow State University), Tamara Eidelman (Moscow High School). Authors: Marina Erokhina , Liudmila Gatagova, Julia Kushnereva, Viktor Shapoval, Olga Strelova, Arthur Tsutsiev, Irina Ukolova, Svetlana Yalovitsyna. Experts: Alexey Feldt, Rauf Gizatullin, Viacheslav Jiburtovich, Taisiya Korepanova, Rumiana Kusheva, Ian Blair McKellar, Harald Frode Skram, Dean Smart, Evgueny Viazemsky.